So I bought this 20€ foldable laptop table: But I work with at least 2 external HDDs at a time, so I needed to find a way of having them "attached" to the table, too. The best, cheapest, most elegant way of going about that I found this after a lot of pondering and looking around the web was this: Which is basically just a tablet and phone holder, which holds both things at once, thereby allowing me to hold my 2 HDDs at the same time. Now, this is when things got a little more complicated than I expected. First I thought of attaching the holder to the top shelf itself. But after putting the HHDs onto the apparatus, I realised I'd be adding a lot of unnecessary weight onto the shelf when I could use one of the legs instead, and it will be much more stable and perhaps even more out of the way. The holder has 2 tripod mounts (that is 1/4-20 screw holes), one —the one that's visible in the image— around the middle and another on the base. I have some GoPro sports-attaching-accessories lying around which I really don't need, so I thought I might give them I try. Right now I've managed to fit a bike handlebar mount onto the leg and it works fine in terms of holding everything in place but it really gets in the way of my wrists, as the mount is much wider than it really needs to be. I've been looking all ove the place for a square mount or rectangular mount, as a pose to a round mount (which is that is used for the handlebar, with is round), but my searches are coming out empty. 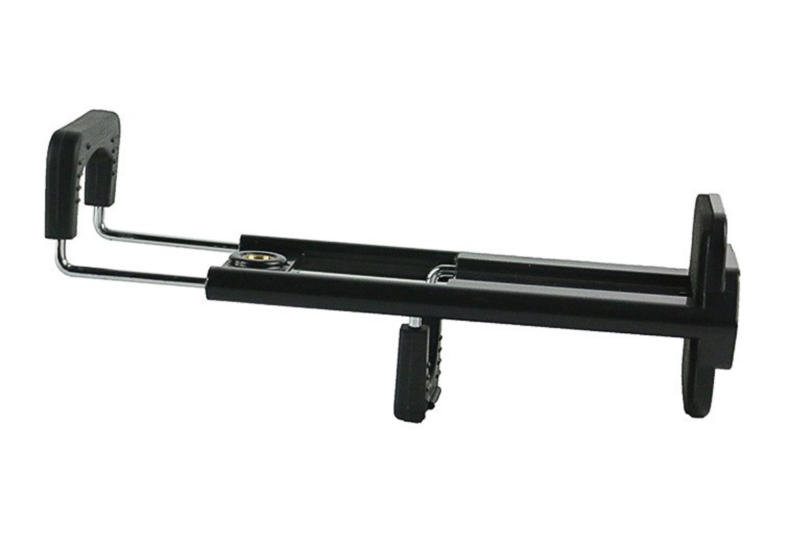 So I want to know if anyone out there knows of a rectangular mount or even what that kind of clamp or mount or bracket would be called, so that I may be able to search for something more adequate? Or perhaps you guys might have a better idea as to how I might attach it. Right now this is basically what I need: I know it's really specific... The chances that I might find something like it with a tripod mount screw attached are very improbable—to say the least. But perhaps someone out there has seen something similar that I might adapt into something more adequate for my specific needs. The measurements of the leg are 15mm on the thin side and 40.50mm on the thicker side. 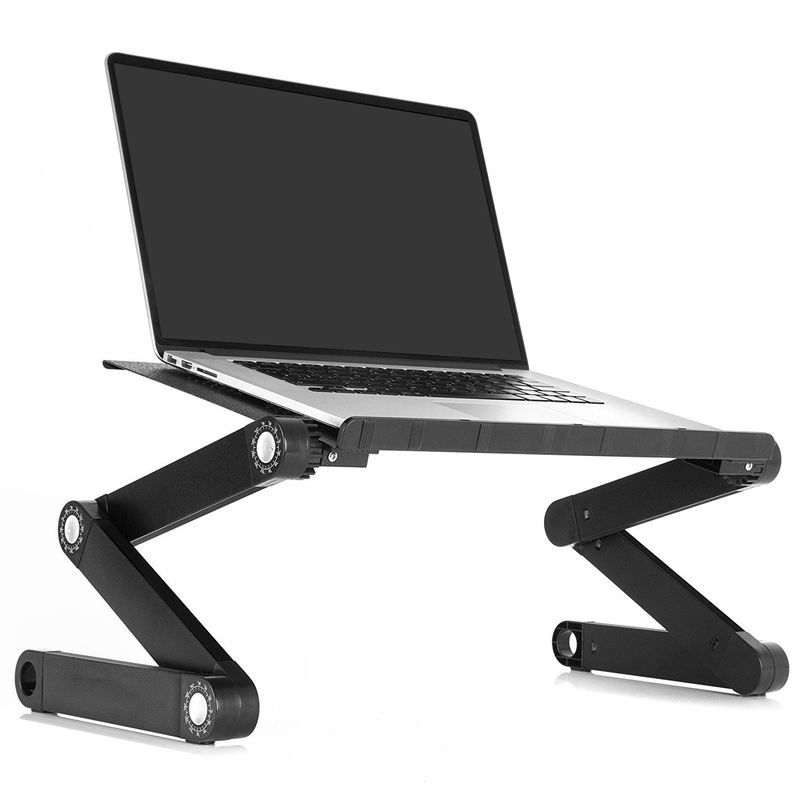 I've also found this mount on Aliexpress which, though a little bit pricy for what it is, it is made of aluminum, like the table's legs, which is cool and is almost the same width which would allow it to be almost flush with the leg. The issue is I need to drill a hole into the leg and somehow attach a 1/4 female tripod screw mount... or drill a hole on both sides and somehow get a 1/4-20 screw that'll go all the way through in order to attach this mount—so it'd have to be at least 16mm long, and it doesn't seem to exist. As you can see, any option I find has it's pros and cons. Any ideas? Please! This question does not appear to be about home improvement within the scope defined in the help center. Pro tip when hardware hacking: When you have to work this hard, yer doin it wrong. Get two mesh pouches - like laundry bag but the size of a cell phone / external HDD. Make sure they have draw strings you can velcro or knot shut. Get a rectangular plate of thick mylar or thin aluminum sheet somewhat smaller than the HDD. Put it inside the pouch. Attach the plate to the bottom of the laptop tray with pop rivets or epoxy. If glued, scuff-sand all flat surfaces. This will trap the upper part of the pouch between laptop tray and plate. Free the lower part of the pouch from the rivets. Put HDDs inside pouches, cords coming through opening. Draw string/velcro to secure. Not the answer you're looking for? Browse other questions tagged screws aluminum brackets mount or ask your own question. what substance should I use to refill a hole in wood? How do I make a dog-leg corners in aluminium framing for fly-screens? 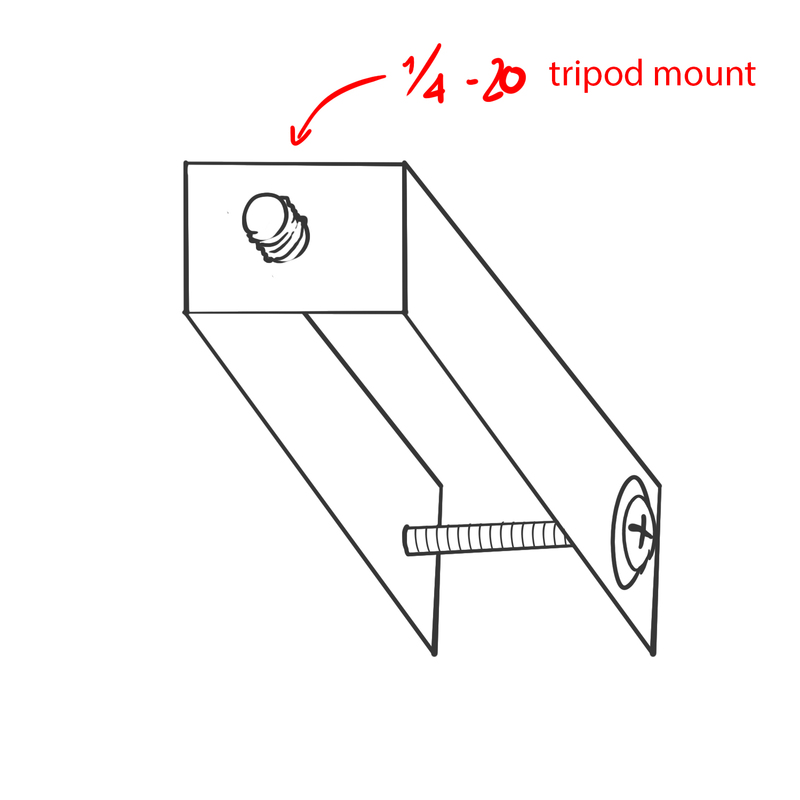 What do you call the attach-y things on the business end of adjustable shelf brackets? What should I do if one of the screws for a TV mount breaks? What tool should I use to unscrew a hard-to-access hexagonal screw? How can I temporarily secure a wooden countertop to its base with limited cabinet access? How should I mount this ceiling light fixture? What is behind my plasterboard!? Studs appear to be random in position and length!